Use our free vegetable garden planner tools to help design your home garden. Design your own garden layout for a backyard, container, raised bed or square foot garden. These free printable planning worksheets and software can be used to diagram and plan your garden layout. 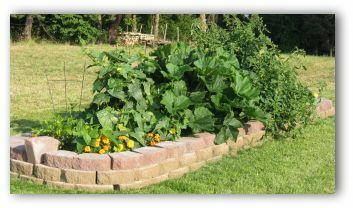 Or use our fun and easy garden planning software to design a small raised bed, square foot or backyard vegetable garden! 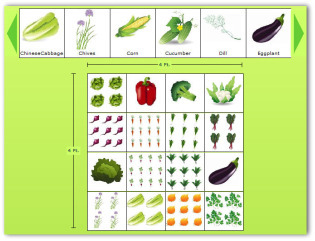 Simply drag and drop the vegetables you choose into the size garden grid you select. It's fun, and simple to plan your vegetable garden layout! Whether you are planning a backyard, container, raised bed, or square foot vegetable garden, the most important step is designing your home garden plan. After choosing a sunny location, determine the type and size of garden that will work best for you. Plan to plant your tallest growing plants on the north side of the garden so that they won't shade shorter plants. When planning a vegetable garden layout, choose your favorite vegetables to plant, use these vegetable garden tips, and you are ready to get started! 1. Choose a level sunny location, away from tree roots and shrubs that will compete with your garden for water. 2. Backyard in-ground row-gardens should be planned to run from north to south if possible. 3. If the garden plot itself cannot be laid out this way, design the rows inside the garden to run from north to south. 4. 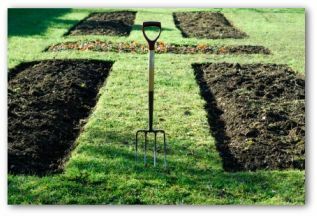 Amend and condition the soil as needed by adding compost, organic fertilizer such as aged-manure, humus, peat moss, and perlite. 5. Allow 2 to 3 feet for paths between rows on your vegetable garden planner worksheets. 1. Choose a sunny location on your porch, deck, patio, balcony for your container garden location. 3. 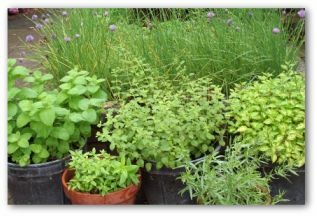 Fill containers with high-quality potting soil with added compost and organic fertilizer. 4. Select compact or dwarf varieties of vegetables that will flourish in a smaller growing area. 5. Water thoroughly and often especially during hot and windy weather. 1. Locate your raised bed garden in a sunny area, running from north to south. 2. Four feet is the ideal width for a raised bed garden, as the garden can be accessed from either side without walking on the garden soil. Any length is fine. 3. Build the border of wood, brick, cement blocks, or decorative stone. 4. Fill raised bed with a mixture of compost, perlite, and peat moss, or pre-mixed garden soil. 1. Divide into 16 one-foot sections using one-inch strips of wood or string to mark the squares. 2. Fill with a mixture of compost, perlite, and peat moss. 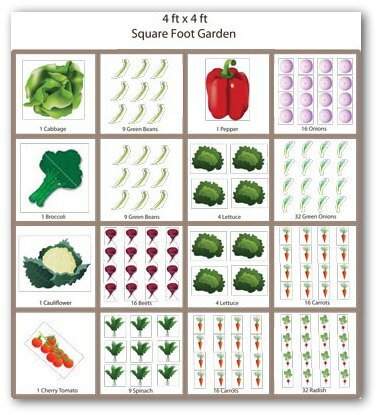 Use the vegetable garden planner worksheet especially designed for square foot gardens. Choose compact, or dwarf vegetable varieties for best results. 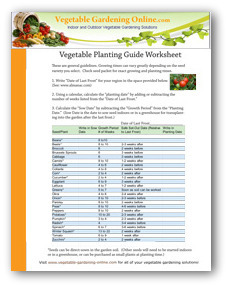 It is helpful to use a vegetable garden planner and zone chart to determine planting times for your area. Or you can call your local garden center or an experienced gardener in your area, and ask them for planting dates. If you want to start some of your garden seeds such as cucumber, peppers, tomatoes or eggplant indoors or in a greenhouse before outdoor planting times, you can use this guide to determine when the seeds should be planted. 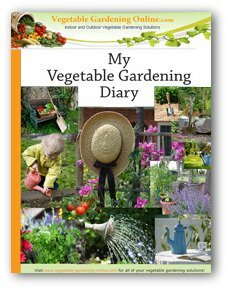 Keep a vegetable garden diary from year to year. Jot down planting dates, vegetable varieties planted, and harvest information. It is often hard to remember information that will be useful in your next garden if you don't write it down! So take a few minutes to keep a journal of your garden. 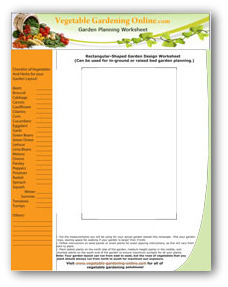 Vegetable garden planner worksheets and the diary can be very useful when designing your garden layout. Having your own garden can be a great way to save money, and begin a rewarding hobby that can bring pleasure for many years.